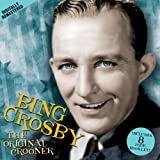 Bing Crosby was one of the most influential vocalists of the 20th century. He was a great admirer of jazz artists, especially Louis Armstrong, and the first white male singer deeply influenced by jazz. Crosby began as a drummer and vocalist with college chum Al Rinker, brother of vocalist Mildred Bailey who found them work in vaudeville. They were soon hired by orchestra leader Paul Whiteman, who teamed them with pianist/vocalist/composer Harry Barris, billing them as the Rhythm Boys. As a part of the trio Crosby made his first film appearance in the King of Jazz (1930). The jazz-playing members of Whiteman’s orchestra impressed Crosby (especially cornetist Bix Beiderbecke) who later employed violinist Joe Venuti and guitarist Eddie Lang, who was his permanent accompanist until Lang’s sudden death. In 1930 the Rhythm Boys went to work for Los Angeles bandleader Gus Arnheim and appeared in the film Check and Double Check, accompanied by Duke Ellington’s Orchestra. Crosby was increasingly featured without Barris and Rinker, and his popularity soared. In 1931 he left Arnheim to follow a solo career which quickly took off with 16 recordings in the charts, three of which were number one. His first feature film appearance was in The Big Broadcast of 1932, and he starred in 20 more features during the 1930s. In the 1940s he teamed with Bob Hope in a series of Road pictures, beginning with The Road to Singapore (1940). His role as an easy-going priest in Going My Way (1944) won him an Oscar as Best Actor, and in it he sang Johnny Burke and Jimmy Van Heusen’s Oscar-winning “Swinging on a Star.” He received two more Best-Actor nominations for The Bells of St. Mary’s (1945) and The Country Girl (1954). For over 50 years his recording of Irving Berlin’s Oscar-winning “White Christmas,” introduced in the film Holiday Inn (1942) which first paired him with Fred Astaire, was a best-seller. In their next film Blue Skies (1946) they danced and sang their way through an Irving Berlin score. Short, stocky and balding, Crosby was not your typical leading man, but he was appealing—from his casual dress to his lackadaisical manner and passion for golf. He starred in his own radio and television shows and introduced some of our most enduring standards: “I Surrender, Dear” (1931), “Pennies from Heaven” (1936), “Moonlight Becomes You” (1942), “Ac-Cent-Tchu-Ate the Positive” (1944), and the Oscar-winning “In the Cool, Cool, Cool of the Evening” (1951). Crosby contributed lyrics to his theme song, “Where the Blue of the Night Meets the Gold of the Day” (1931) and to “I Don’t Stand a Ghost of a Chance with You” (1932). The most memorable of his later films, High Society (1956), reunited him with long-time friend Louis Armstrong and featured him with supposed-rival Frank Sinatra. Crosby died on tour while playing golf in Spain.